Traditional 1 pint, Sheffield-made pewter tankard, with sculpted dragon handle. Alchemy are best known for their fine English pewter creations, but also incorporate many alternative materials and finishes in their truly unique designs of exceptional quality… Extraordinary Design. Robust, heavy gauge 1 pint (600ml) tankard with simulated horn 'fertility' handle of traditional Viking style, set in carved Nordic, zoomorphic dragon knotwork, pewter mounts. 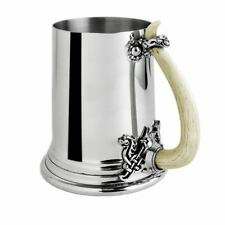 Heavy gauge, 1 pint, Sheffield-made pewter tankard, with Viking-style bone resin handle. Viking Horn Pewter Tankards Set of 4. Alchemy England pewter products are each hand-made from the finest quality English Pewter, which, like silver, may naturally tarnish dependent upon the conditions to which it is subjected. Alchemy England pewter products are each hand-made from the finest quality English Pewter, which, like silver, may naturally tarnish dependent upon the conditions to which it is subjected. Silver Dragon Pewter Tankard Set of 4. Traditional 1 pint, Sheffield-made pewter tankard, with sculpted dragon handle. 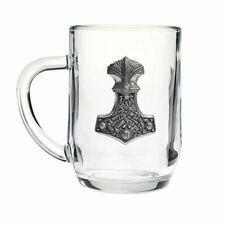 Robust 1 pint (600ml) tankard with simulated horn fertility' handle in traditional viking style, carved pewter mounts. Materials: Fine English Pewter with Resin Handle We are an authorized distributor for Alchemy 1977. 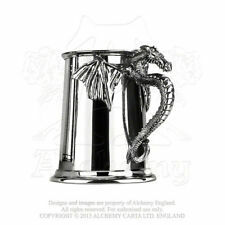 This breathtaking sculpted dragon in full flight, forms the handle of this stylish 1 pint capacity (600ml) tankard. Materials: Fine English Pewter with Cast Handle We are an authorized distributor for Alchemy 1977. Ideal for serving beer or punch cocktails! We answer all enquiries within 24 hours. Love Skulls?. Then look no further than this glass drinking 'mason style' jar! The perfect addition to your skull collection. Fill it with your favourite tipple and you will be the dark envy of all! Tankard ALCHEMY GOTHIC - Silver Dragon - AAT10 stylish tankard handle from English pewter - very precise details and design. Suitable for drinking both hot and cold drinks. Content approx. Weight approx. Measures Approximately 135mm x 150mm x 111mm at Widest Points Hand made in England from the finest English lead free pewter .